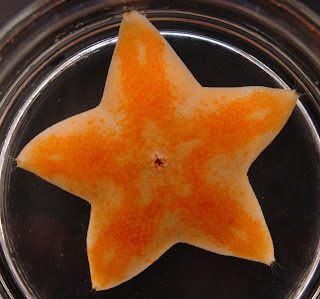 The Echinoblog: Pteraster & Kin- Starfish that FIGHT BACK with MUCUS! Pteraster & Kin- Starfish that FIGHT BACK with MUCUS! Everybody LOVES mucus! Yes! Don't deny it! What would our lives be without it? Dry, boring and unlubricated. 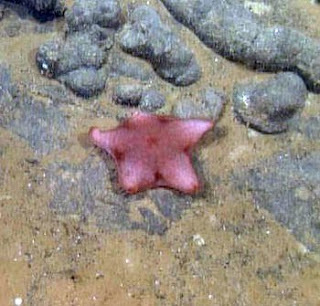 I thought I would kick off the Fall with one of my favoritest and weirdest of echinoderms.. Pteraster and its kin aka the Slime (or Mucus) Stars!! 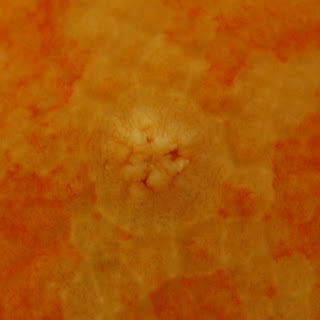 Pteraster is one genus in the family Pterasteridae. This is group of starfishes that includes 8 genera that mostly live in cold-water habitats, but are most diverse in the deep-sea. 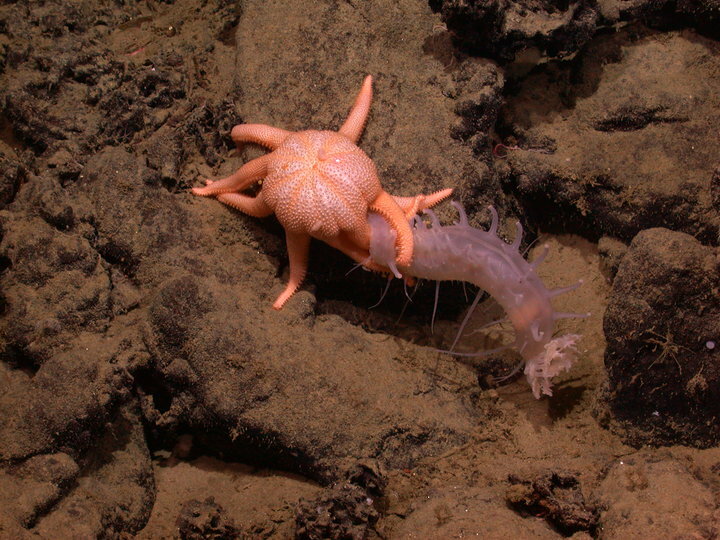 The genus Pteraster alone includes about 45 species that occur worldwide, from the Arctic to the Antarctic and all the deep, dark places in between... Many of them eat sponges. So, on the surface, fairly harmless..
We'll be focusing on one particularly well-studied species, Pteraster tesselatus that occurs on the west coast of North America between California and Alaska. What makes Pteraster and all of the Pterasteridae so unusual? 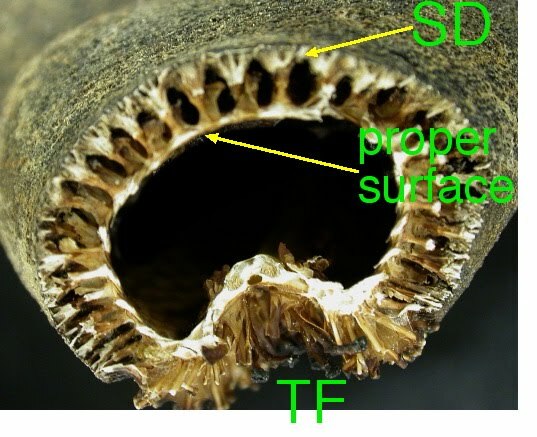 The surface of the animal is actually concealed below a tent-like covering [called a SUPRADORSAL MEMBRANE (SD in the figure below)] that extends OVER the animal's proper surface!! That proper surface below the supradorsal membrane is where you would find the typical features on a sea star's surface, such as the gills and etc.. Here is a cross-section through the arm. 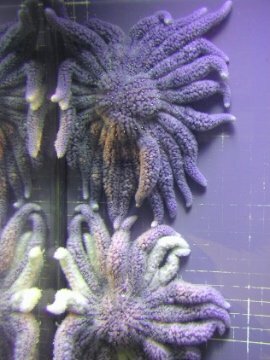 Tube feet on the bottom. Why is this important? 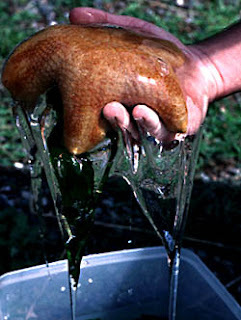 Well, its through the supradorsal membrane that the SLIME comes out!! 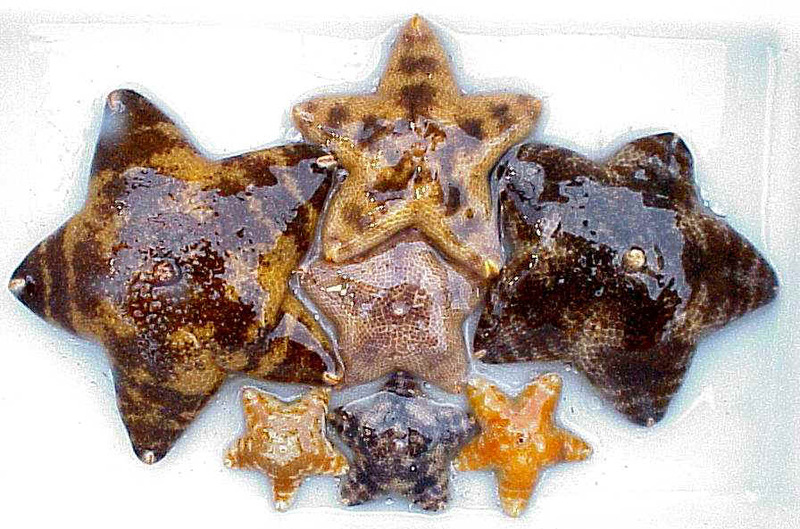 So, let's cut to the chase-Pteraster tesselatus earns its common name "the Slime Star" owing to its ability to defensively SPEW MUCUS when annoyed by unwanted contact (and who wouldn't want to do that??) !! GOBS and GOBS of it. Note to you grammar types... MUCUS= noun. MUCOUS=adjective! 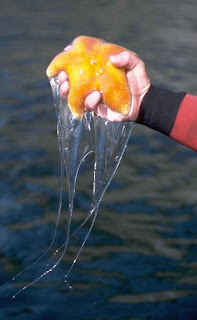 This picture illustrates a typical encounter with Pteraster. Pick it up, and the next thing you know...you've got a bucket full of mucus! Much of the info presented herein was based on studies by James Nance (Texas A& M University) and Lee Braithwaite (Brigham Young University) from some neat papers in 1979 and 1981 in the Journal of Experimental Marine Biology & Ecology. Within the supradorsal membrane are a VAST number of mucus producing cells both on the surface and throughout pores present all throughout. When Pteraster feels threatened, water enters the animal via the bottom tube foot grooves and flows throw the body cavity and up into the cavity between the animals' surface and the supradorsal membrane. Mucus is produced by cells in the supradorsal membrane. ....and all of the little pores in the supradorsal membrane OPENS!! 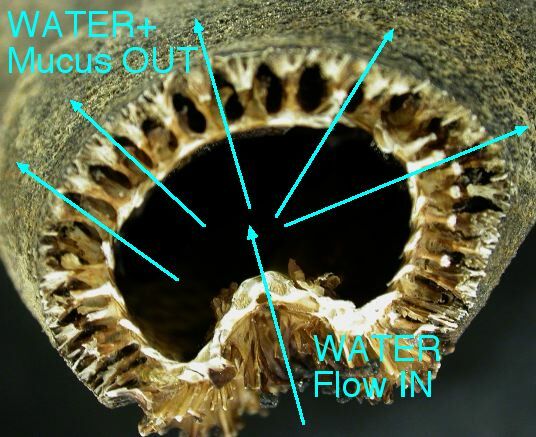 So, water pressure EXPELS the Mucous-Water mixture out of the supradorsal membrane!! ShABLURRRUUUUUBBBBPTTTHHHHHHHH!!!!!! (noise is simulated-Pteraster does not actually make this noise unless you REALLY want it to. Then, go ahead-knock yourself out! )and you get THIS! But WHY does it do that? Would could POSSIBLY offend such an innocuous creature? That just wants to sit around eating sponges all day? Solaster..usually Solaster dawsoni, which feeds mostly on other starfish. 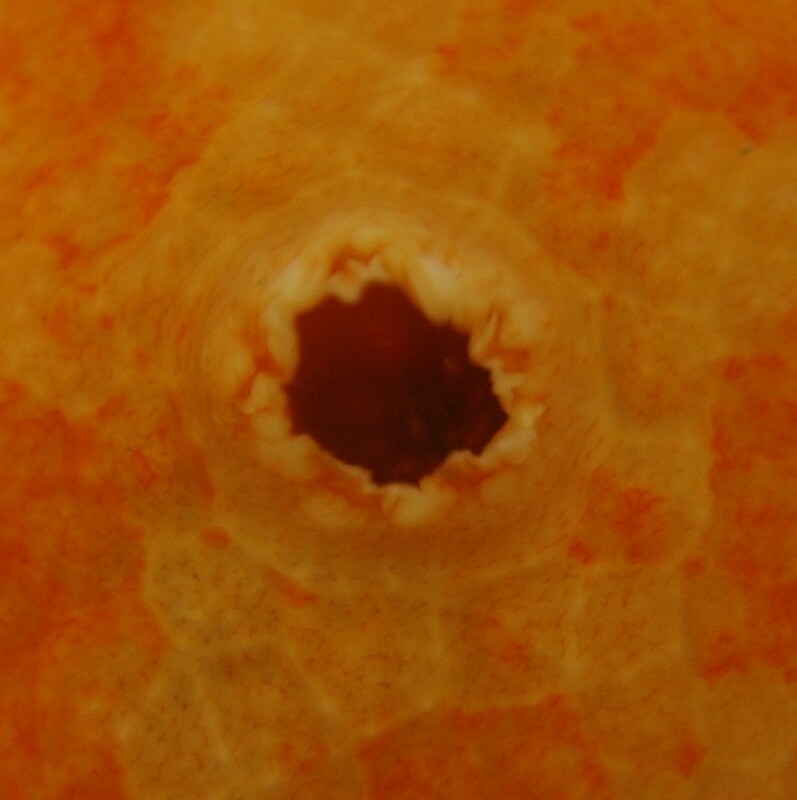 Solaster (diameter=24 cm) can apparently take up to FOUR DAYS to devour an undefended Pteraster (about 14 cm across)! And that's basically Pteraster being devoured alive! Tests using mucus applied directly to food being eaten by either of these two species almost instantly resulted in the predator moving away VERY quickly. Lab tests applying mucus to fish and other invertebrates, such as snails and etc. also results in avoidance or outright fatality following extended exposure. The mucus probably contains saponins or something similar. I've talked about how 0ther starfish species use saponins as a means of discouraging predators here..
the deep sea North Pacific, which is practically MADE from clear gelatinous goo! And if you pick them up? You get the mucous love! or to say it another way.. "It slimed me!" But this simple behavior begs a lot of interesting questions. If the slime is defensive then WHAT PREYS on the other species around the world in the deep sea? What about the tropical Pacific Euretaster? Is the slime more or less toxic where specific predators are around? How has this affected the long term evolution of the Pterasterids? very interesting topic and photos! This is fantastic! What a neat (and gooey!) little critter.